Click the Texture button in Archipelis and load the baby bird. 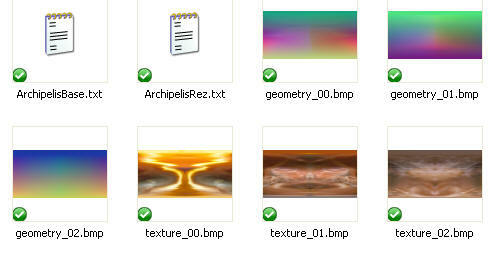 You can also Drag and Drop the texture into the main blue window. You will see that the image is not centered and is too large. 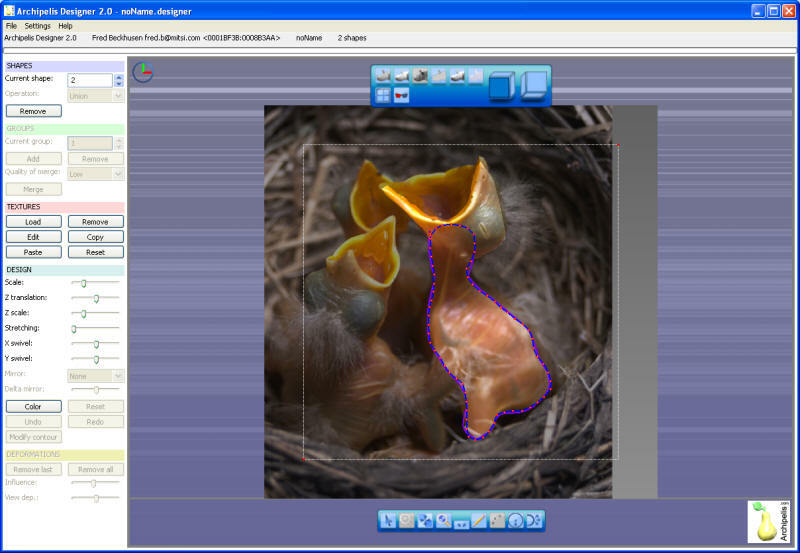 The next step is to get the birds to fit the screen, inside the white dotted line. 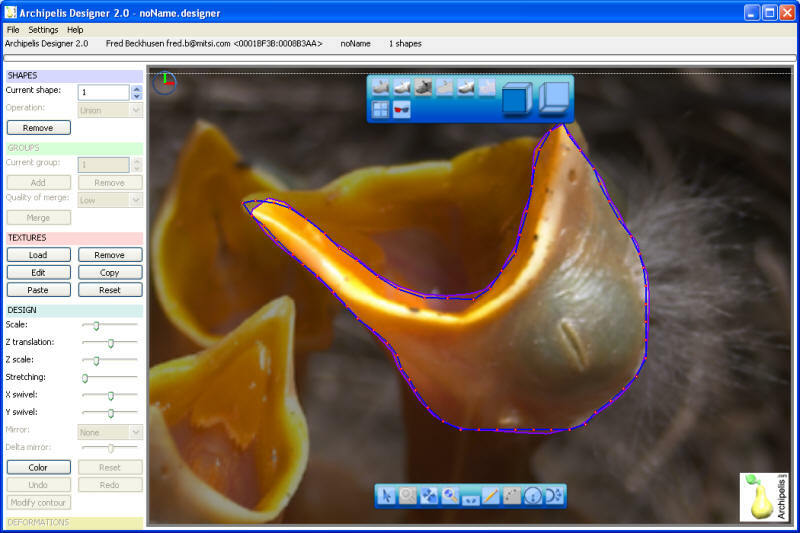 The bird should be inside the white dotted line, and as large as possible. 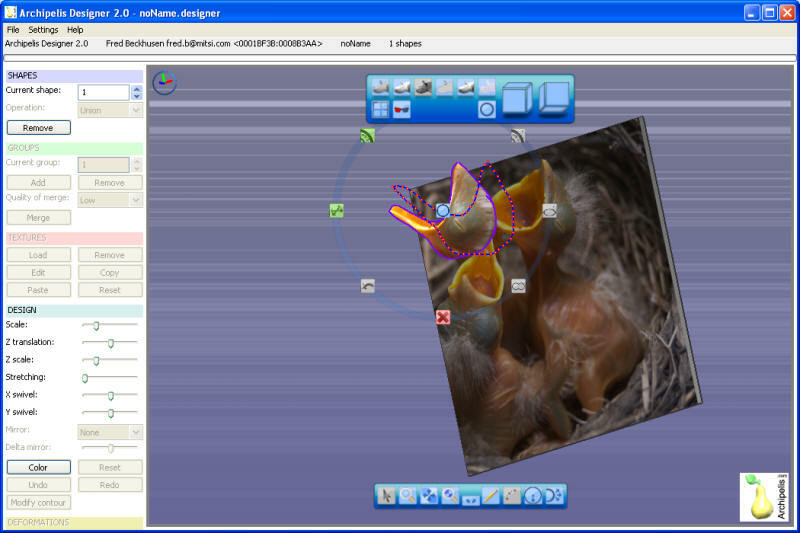 Using the Right-mouse button, draw a line around the head of the bird. 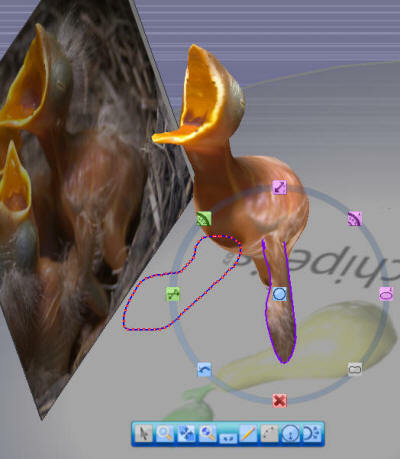 I am drawing down the center of the mouth of the bird, not the far side, as Archipelis will mirror the bird and make the other mouth half for me. 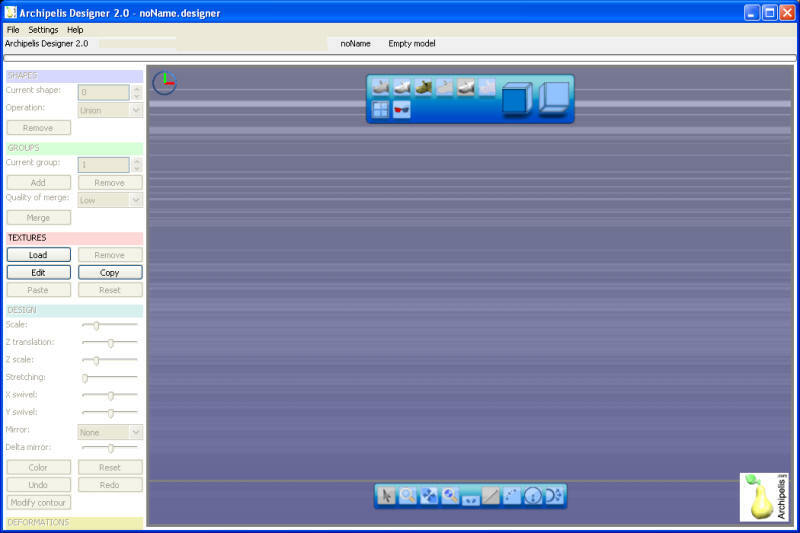 When you let go of the mouse, you should see new controls appear around the selected area. Click the white circle in the middle to exit this menu. Need more detail? 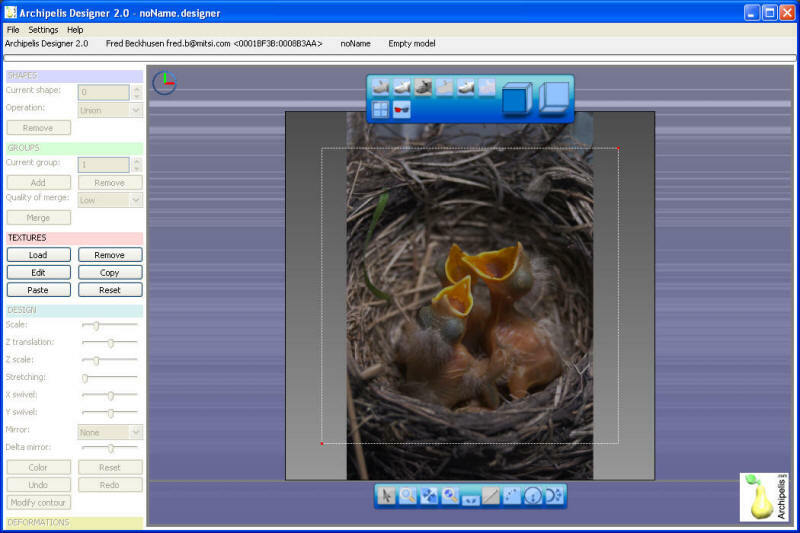 Click the Zoom Tool on the left side and click-select and area of the screen. This will make red dots appear around the area that you drew. You can right-click these dots and move them around. One you have moved the dots, click "Modify Contour" to save your changes. You should be able to look all around the model. In my case above, there was a small problem that commonly occurs: you can see a white area along the back of the birds head. 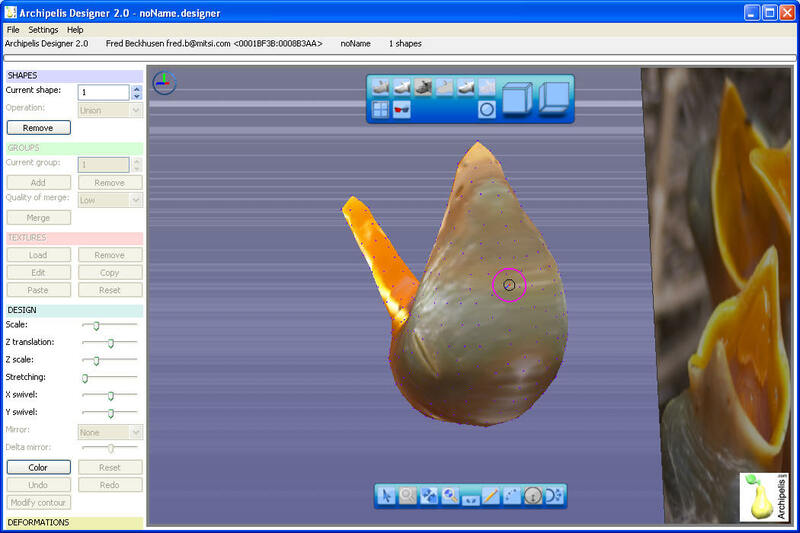 The edges stretch into textures that are not part of the bird, There are two ways to correct this: Relocate the red dots with the contour tool, or to re-shape the edge with the Deform tool, as shown next. We will be using these tools later to make the bird nest. 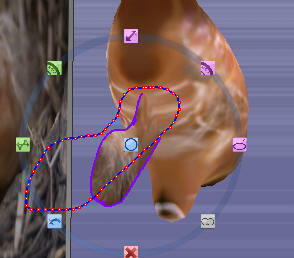 I have used the arrow on the tool bar to rotate the view, then I clicked the Zoom button to zoom in to the problem spot. 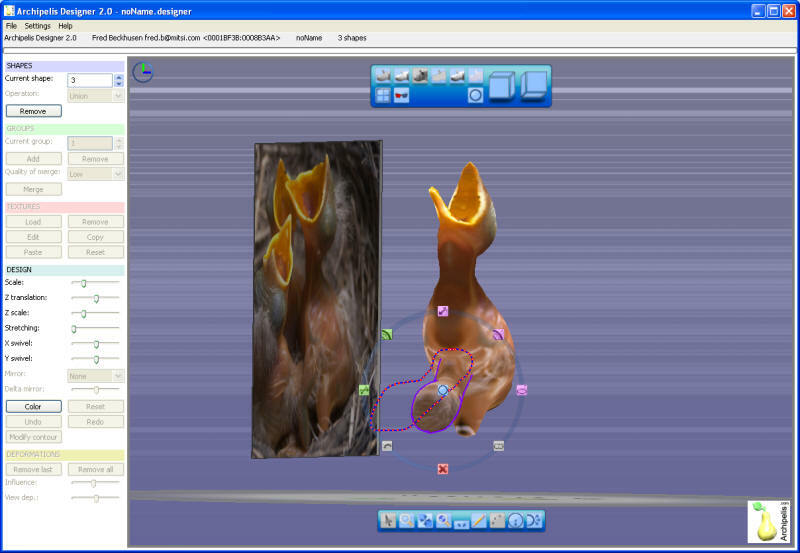 You can repeat this action to make the edges smoother. 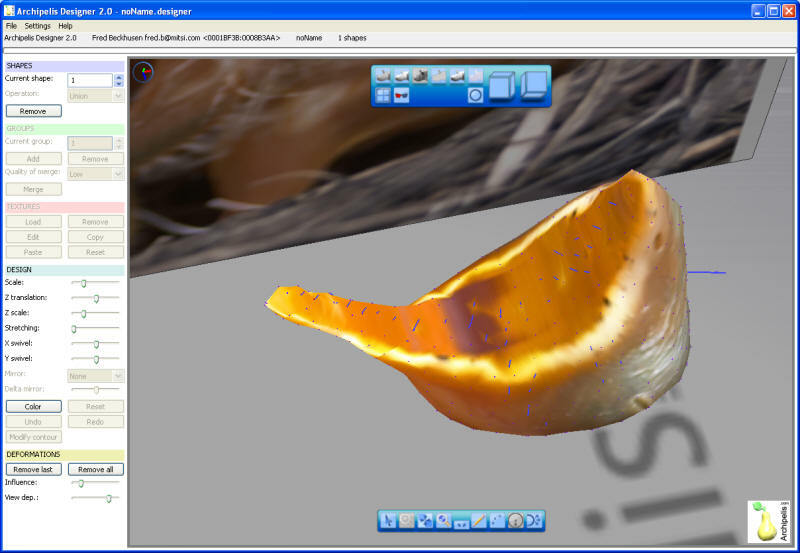 You are actually pushing in the edges of the outline into the textured area, so a little pushing can re-shape your model. If you make a mistake and push too far, you can pull it out with a downward stroke of the right-mouse button, or you can remove the entire modification with Remove Last or Remove All buttons. 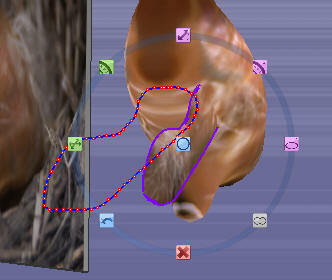 You can also control how far the effect spreads and how hard it pushes with the Influence and Depth sliders. Select the wing, and shrink the Z scale down so it looks more thin, like a wing. Later, we will upload the one wing, and copy it in Second Life. Since no one will be able to really look and count the feet on our small baby, I have decided to save a prim and make only one large foot. 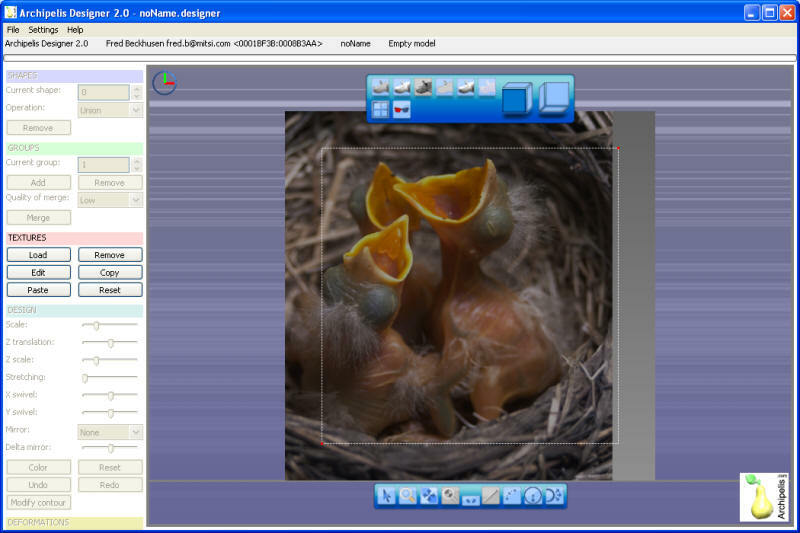 Save you model into a new folder and give it a name such as 'Baby Bird'. This will make a "Baby Bird.designer" file that can be loaded and reworked if you wish to make changes. You can download the entire set from this Zip file.